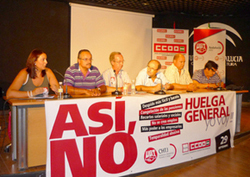 As unions build a European-wide day of action against austerity policies on September 29, Spain's national trade union centers CC.OO and UGT are preparing for a national general strike on September 29. In the first of a series of interviews with IUF members about the planned strike, the IUF spoke with Javier González Martino, General Secretary of the Commerce, Hotel and Tourism Union of the Comisiones Obreras (FECOHT-CC.OO). Workers on strike at New York state juice and sauce maker Mott's ended their nearly four-month strike by voting to approve a contract on September 13 that preserves their threatened pay and pension plans. The 300 members of RWDSU Local 220 walked off the job when the company, swimming in record profits and CEO compensation, demanded across-the-board wage cuts amounting to some USD 3,000 annually, substantial cuts in benefits and the winding up of the company pension plan. Nestlé has announced with typical media fanfare a 10-year "Nescafé Plan" to help the company "further optimize its coffee supply chain". Nestlé plans to double the amount of Nescafé coffee purchased directly from farmers over the next five years. There's also a specific Nespresso component to the plan - unsurprising, since Nespresso is Nestlé's fastest-growing brand. Over 1,500 cases of potentially fatal salmonella enteritidis poisoning across the United States have been linked to production from two interlinked giant producers. The poisonings have led to the largest-ever recall of eggs – over half a billion so far. 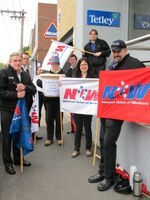 Australian unions in the state of New South Wales led by Unions NSW (formerly the Labour Council) held a demonstration on August 30 in front of the Nestlé-owned Nespresso shop in Sydney’s city center. The action, which resulted in the temporary closure by management of the Nespresso shop, was taken in support of the IUF-affiliated SBNIP representing workers at the Nescafé factory in Panjang, Indonesia. Solidarity with UPS Turkey Workers! The International Transport Workers' Federation (ITF) has called for global solidarity with their affiliate TUMTIS at the Turkish subsidiary of global logistics giant UPS. Since April 13, when management began resorting to physical intimidation and forced resignations to crush an organizing drive, 157 union members and supporters have been dismissed by UPS and its subcontractors: 126 at 3 UPS facilities in Istanbul, 27 in Izmir and the remainder at 2 other cities. Read more about Solidarity with UPS Turkey Workers! Just two weeks after the victory in Coca-Cola Multan, workers at Coca-Cola Pakistan's Faisalabad plant had cause to celebrate yet again today, as their union was officially registered. Our Message to Tata – We Have Had Enough of Your Excuses! Solidarity actions were held in Australia and the UK last week to protest the ongoing denial of rights at the Tata Group-controlled Nowera Nuddy tea plantation in West Bengal, India (click here for background story). Read more about Our Message to Tata – We Have Had Enough of Your Excuses! The IUF has filed a second complaint against UK- based Compass Group under the OECD guidelines for multinational enterprises in response to the firing of two union activists in Turkey. A new report is warning millions of tea drinkers in Britain that their breakfast cuppa may come from Indian workers toiling for 7p an hour – well below a living wage. 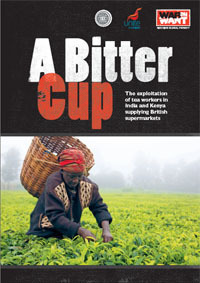 A Bitter Cup, co-published by IUF, Unite the Union and the British charity War On want, was launched to coincide with the UK prime minister David Cameron's trip to India at the end of July. It shows that workers in northern India earn just INR 1,220 compared to a living wage of at least INR 3,500 a month. Read more about What's in Your Tea? Tata India – Are its Tea Estates Above the Law? An international IUF fact-finding team has been denied access to an Assam plantation to investigate the recent deaths of three workers. The plantation is owned by Amalgamated Plantations in which Tata Global Beverages is the major shareholder. The 930 hectare Powai estate has one of the world's largest tea-processing factories and employs some 1,800 permanent and 1,200 temporary workers. Read more about Tata India – Are its Tea Estates Above the Law? 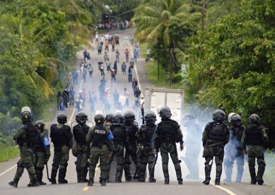 At least two banana workers were killed on July 8 as police opened fire on striking workers in the province of Bocas del Toro. Four thousand workers at the Bocas Fruit Company struck over wages at the beginning of the month, and were joined by thousands of independent producers in the cooperatives with their own grievances.